MGA’s Structural Series equipment solutions are hydraulic-based quasi-static based systems that are designed to perform testing according to specific regulations. These systems are designed so that all related standards from various regulatory agencies that address a particular safety issue are satisfied with one machine. For all of these machines, the hardware for the control system is based upon the same platform, while the software has been customized for the specific applications. MGA Research Corporation, a world leader in safety test equipment solutions, offers a state-of-the-art Seat and Seat Belt Anchorage System. 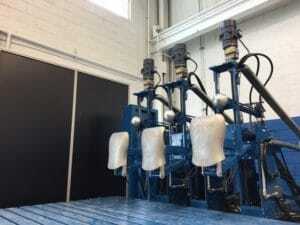 This system is used to evaluate the strength of seating structures when subjected to specified loads. The system includes a base, A-frame, T-slot plate, three or four cross members, and up to ten hydraulic cylinders. A user-friendly control/data acquisition utilizing the latest hardware, combined with customized software written to specific test standards, commands the system. Test personnel can easily master the system with training from MGA Engineers who have decades of experience with anchorage testing. MGA’s Seat & Seat Belt Anchorage design has been upgraded periodically based upon changes to legal requirements, feedback from a worldwide customer base, and experience of engineers using the systems at MGA laboratories. See Seat Anchorage System in our catalog. The MGA Head Restraint test system is the ideal tool for the evaluation of seat and head restraint systems to the performance requirements of such standards as FMVSS 202a, ECE R17, ECE R25, GB 15083, etc. MGA Research Corporation, which also operates laboratories throughout the U.S., utilizes the same equipment for NHTSA compliance testing. The complete package consists of one to three occupant test stations, a T-slot work surface, hydraulic unit, and loading application forms. It also includes a user-friendly control/data acquisition system utilizing the latest hardware, combined with customized software written to specific test standards. Test personnel can easily master the system with training from MGA Engineers who have decades of experience with testing head restraints. 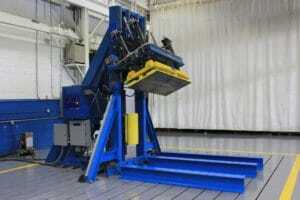 See Head Restraint System in our catalog. MGA has designed and assembled a new generation FMVSS 214/216 Side Intrusion and Roof Crush Test System that complies with the requirements set forth by the NHTSA and IIHS. 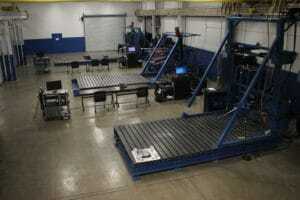 This dual-purpose system is capable of performing testing in which loads may reach up to 50,000 lbs. The complete package consists of a high strength test frame, roof-crush system, side-door intrusion system, a T-slot work surface, hydraulic unit, and applicable calibration/ measurement devices. It also includes a user-friendly controller and data acquisition utilizing the latest hardware, combined with customized software written to specific test standards, to control the system. In addition, test personnel can work with MGA Engineers who have extensive experience and knowledge in all aspects of these testing including criteria, data, requirements, and test procedures. MGA has been conducting FMVSS 216 and 214 testing for over 30 years. See Roof & Side Crush Strength System in our catalog. John Gizowski at john.gizowski@mgaresearch.com or by phone at (248) 577-5001.